If you are looking for information on the Bahama Buck's franchise business opportunity, Bahama Buck's franchises or Bahama Buck's franchising, then you have come to the right place. Bahama Buck's, the nation's premier tropical dessert franchise, is a concept so cool - that it's hot! 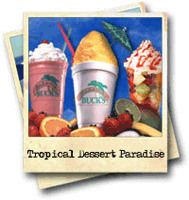 Providing our guest with a "Taste of Paradise", Bahama Buck's is the ultimate tropical dessert experience. 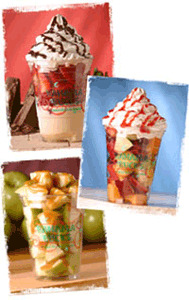 Paradise product innovation and excitement take place everyday at Bahama Buck's. Our marketing strategies are designed to excite customers and to increase our brand awareness while providing the tools and coaching to make your store better every week. We are committed to growing our relationship with our customers - a passion we will share with you. Bahama Buck's works closely with financial institutions that have experience in assisting franchisees in obtaining financing. Bahama Buck's does not provide financing. 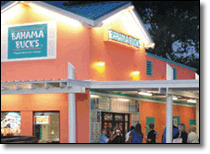 We do, however, establish a line of credit for our franchisees for purchases made through Bahama Buck's. Bottom line - Bahama Buck's is committed to making you the best owner you can be.